(Nanowerk Spotlight) While many dynamic systems are lubricated by fluids of various kinds, modern technologies, like aerospace, clean room equipment, medical devices and machines, require the application of dry coatings which exhibit reduced friction and wear. Lubrication of dynamic surfaces by fluids adds complexity, weight and cost to the system, which imposes various constraints and limits the performance of these systems. Self-lubricating coatings, i.e. coatings which exhibit reduced wear and friction without resorting to tribological fluids, have been known for many years and are in use for a variety of applications. Numerous studies have shown that different nanoparticles, impregnated into metal, polymer, ceramic and other coatings, can provide these materials with enhanced tribological performance. Prominent among these additives are the fullerene-like (IF) nanoparticles of tungsten disulfide (WS2) and molybdenum disulfide (MoS2). New research shows that it is possible to obtain self-lubrication of hard (i.e. dry) coatings such as cobalt by impregnating fullerene-like nanoparticles of WS2 in such coatings. The coating serves as a reservoir of nanoparticles which are slowly released from the surface and provide easy shear and reduced oxidation of the coating or native metal surface, which is a common phenomenon in tribology (friction and wear) of metallic surfaces. IF-WS2 and IF-MoS2 nanoparticles are known to provide superior tribological action when mixed with oils and greases and when they operate under harsh tribological conditions. 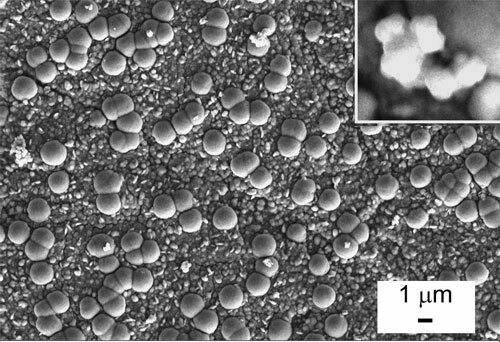 The effect of these nanoparticles was attributed to the facile rolling of the nanoparticles; the reason why they are also called nano ball bearings. A more thorough analysis, however, showed that this model is too simplistic and does not provide the whole picture. The lubrication mechanism was found to be much more complicated than initially thought. Analysis of the IF nanoparticles following tribological tests revealed that some of the nanoparticles residing at the contact area were deformed, broken or partially exfoliated. This gradual exfoliation of the nanoparticles lead to the formation of nanosheets of WS2 which cover the metal surface and provide easy shear and surface protection against wear. "What was much less known was that when the nanoparticles are embedded in a coating they are slowly released and exfoliated and then they basically do the same kind of job" Dr. Reshef Tenne explains to Nanowerk. "Early work on nickel coatings (3 years ago) have indicated the possibility for having self-lubricating surfaces. Furthermore, recent work showed the potential of such coatings in numerous medical technologies (see "Self-lubricating coatings containing fullerene-like WS2 nanoparticles for orthodontic wires and other possible medical applications"). Our recent study shows also that very hard coatings like cobalt, which have numerous industrial applications in bearings and machine parts, can be made self-lubricating providing many technological advantages." Tenne is director of the Kimmel Center for Nanscale Science, Drake Family Professor of Nanotechnology and head of the Department of Materials and Interfaces at the Weizmann Institute of Science in Israel. His group has produced a large body of work on inorganic fullerene-like nanostructures and inorganic nanotubes since the early 1990s. Tenne is most notable for his prediction in 1992, following the discovery of carbon nanotubes, that nanoparticles of inorganic compounds with layered structures, such as MoS2, would not be stable against folding and would also form nanotubes and fullerene-like structures ("Polyhedral and cylindrical structures of tungsten disulphide"). In their recent work, Tenne's group impregnated cobalt coatings with IF-WS2 nanoparticles by depositing them on stainless steel substrates by either electroless or electrodeposition (electroplating) processes. These coatings were found to provide very good tribological behavior under high loads. Furthermore, these new coatings also exhibit magnetic behavior, offering new opportunities for applications of such nanocomposite coatings in automotive, aerospace, home appliance and other fields. "We assume that the occluded aggregates of the IF-WS2 nanoparticles are relatively loosely connected to the cobalt matrix and they are gradually released under friction" says Tenne. "Rolling/sliding of these particles around the contact spot and the slow deformation and exfoliation of the nanoparticles provide low friction and wear." There are many machine parts which are made of cobalt coatings and there is great interest in industry to apply this technology for improved tribological coatings. Tenne's lab has licensed their technology to a company called ApNano Materials which is working on commercializing this technology. The company has already launched NanoLub™, the world's first commercial solid lubricant based on spherical inorganic nanoparticles. ApNano claims that NanoLub™ reduces friction and wear significantly better than conventional lubricants especially at high loads, prolongs device service life, and lowers maintenance costs and downtimes. It is useful in applications ranging from machines and tooling to jets and satellites. "There are still many challenges facing us in the synthesis of the WS2 and MoS2 nanotubes which have many potential applications in strengthening nanocomposites" says Tenne. "Other challenges pertain to the synthesis of new kinds of nanotubes and fullerene-like structures with interesting electronic, magnetic and catalytic applications." Tenne's recent paper, titled "Fabrication of self-lubricating cobalt coatings on metal surfaces" was published in the February 7, 2007 online edition of Nanotechnology.